Is it my imagination, or is Wyandotte THE most popular street in Windsor these days? Everywhere you turn, you read about some section of Wyandotte being dug up, expanded, rearranged, extended and generally being toyed with. The eastern-most end of the street is now snaking its way out into the suburban nether-regions, reaching the land of the suburbanites who tend to flee the core area. Expensive bridges are being built to accommodate their commute and the infrastructure costs are spiraling out of control. All this is happening while the crumbling water mains and sewers in the older neighbourhoods are being neglected to the point of failure. Wyandotte is like the multiple-personality afflicted character Cybill, displaying all kinds of different personalities depending on when and where you explore. Heading west from this suburban personality of Wyandotte, you find the street widening out into 4/5 lanes of asphalt wasteland. Continuous road upgrades live here. The only people negotiating this stretch of Wyandotte on foot are those unlucky souls whos cars have broken down. No pedestrian life exists here. A glimpse of the entire street's future, perhaps? Further west, you begin to approach the older parts of this street. The section running through the area that used to be the outlying industrial area of Walkerville prior to Windsor’s annexation of it and Riverside. This is where the Ford Motor Companies and Hiram Walkers of the area set up shop and needed rail infrastructure to carry on with its business. They financed tunnels and bridges, rail connections to ship their goods and links to the river to load their merchandise onto barges. It’s a fascinating area with bridges and buildings dating back to the 20’s and 30’s. Unfortunately it is also considered a bottle-neck for the efficient movement of motorists, and we all know where in the hierarchy historic conservation lies in comparison to “growth”. So, it is this area that is receiving a ton of attention (and tax dollars) from our cities Department of Public Works who is tearing down one old bridge (built by hand in 1931 by the Town of Walkerville) and rehabilitating the other one in the hopes that motorists will begin to chose this street to move through the city as opposed to Riverside Drive, which currently acts as an east-west mini-expressway. Here’s a chance for me to allay some of my guilt. For years, a group of alternative transportation activists have been lobbying our municipal leaders to include bicycle lanes on Riverside Drive, myself included. We have been fighting for cyclists and pedestrians rights to be included in our local transportation planning priorities, and this was a great way to launch a high-profile battle against the well-heeled residents who didn’t want anything to do with these “Cyclists”. Well, the result of this lobbying was the passing of the Riverside Drive Vista Improvement Project, whose unfortunate by-product was the shifting of motorist capacity over to Wyandotte, which the city has stated has “excess capacity” (if this is true, then why do they have to tear a lot of it up and add vehicular lanes?) I feel like Wyandotte has been sacrificed for a pleasant motoring experience on Riverside Drive’s “Scenic Drive”. "4/ Traffic Diversion ...The third and most important element of traffic diversion is to provide Wyandotte Street east with the capacity and operational characteristics to attract and accommodate through traffic diverted from Riverside at an acceptable level-of service.This will be accomplished by implementing the East Riverside Secondary Plan recommendation to extend Wyandotte Street and McHugh Street east, by enhancing the capacity of Wyandotte Street East with potential peak period on-street parking restrictions and by reviewing the warrants and timing of traffic signals on Wyandotte Street east." So, at this point we've torn down an historic structure, levelled out the trench and widened it to accomodate the vehicular flow (except the cyclists - they don't get any bike lanes here). 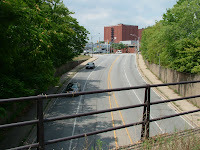 This brings us to the intersection of Walker and Wyandotte, which through 2001's Walker Road Corridor Class Environmental Assessment process, was determined needed infrastructure improvements and an increase in capacity. According to a city official, "(b)asically the future design is for Wyandotte to be 5 lanes (2 lanes in each direction plus a common turning lane) from Monmouth to St. Luke and left turn lane installed on Walker at Wyandotte. The next couple of years have been budgeted for design and land acquisition." So, in a nutshell, you will have 5 lanes of traffic from the eastern most urban sprawl funneling into Olde Walkerville - which the city has "branded" The Distillery District" - which has only two lanes of traffic. The city will then, according to the RDVIP, begin to remove on-road parking to accomodate the huge flow of suburban commuters who will, by design, be washing out any remaining signs of the walkable community it once was. Sounds like Smart Growth to me! 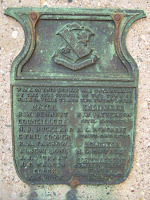 UPDATE: Those bronze plaques attached to the Wyandotte Subway have been stolen. Little surprise in this city. Posted by Chris Holt at 11:02 a.m. Damn -- I hate when I'm right. I remember when the whole deal with Riverside Drive crept up. Part of me wanted the bike lanes, the other part of me knew that we were sacrificing Wyandotte in the process. Most of my co-workers can attest to my verbal tantrums at the idiots in office who were making Windsor decide between bicycling lanes and a prominent historical route. Why is it that Windsor has the undying need to purge the old and rebuild crap in its' place? The only other city I know of who did that was Las Vegas -- every time another super casino was to be built they just imploded the old ones and built a new monster in it's place. Windsor is imploding, only this time its' in slow motion. August 17, 2007 at 1:02 p.m.
And because of Windsor's lack of long-term vision and a decades-long, highly-funded, American Dream marketing blitz, this is what the majority of ratepayers believe is "progress". This is why I believe the weak link in our attempts to move Windsor in a more sustainable and community-focused direction is communicating the need to rethink our transportation and land-use priorities. I just wish some local philanthropist with very deep pockets would come on-line and help out. Without us being able to match the level and quality of the pro-suburban-growth ad campaigns, we don't stand a chance. August 18, 2007 at 11:29 a.m.